M. SARAVANAN: You can say, 'I appealed', but until you set aside that order, thats the order. KUALA LUMPUR: MIC president Datuk Seri G. Palanivel has not been sacked from the party, however his membership is automatically null and void, said MIC vice-president Datuk M. Saravanan. “Do not misinterpret. If a person brings MIC to court, that person automatically loses his membership. 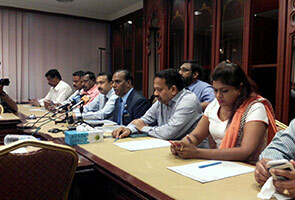 “The MIC Constitution Article 91 states that any MIC members who proceeds to court against the decision of the Central Working Committee (CWC) or without its knowledge will lose their membership automatically,” said Saravanan in a press conference at the party's headquarters, today. He added that the 2009 CWC was currently in power as per the Registrar of Societies (RoS) directives and court ruling. "Who is in power today, the 2009 CWC as ruled by the court, there’s no any other directive, the only directive you have today after their loss is the CWC 2009, that is final. "You can say 'I appealed', but until you set aside that order, that’s the order," he said. On Monday, the High Court dismissed two judicial review applications by Palanivel and other MIC leaders challenging the Registrar of Societies order for the party to hold fresh elections. Judge Justice Asmabi Mohamad ruled that the court has no reason to interfere with RoS decision and dismissed the applications to pay RM90,000 in costs. Palanivel had suspended the membership of 15 leaders for a period of 12 months including deputy president Datuk Seri Dr. S. Subramaniam and Saravanan on Tuesday. However, in the press conference held today, former senator Tan Seri G.Vadiveloo has also said that since Palanivel's membership is void he no longer has power to make any party decisions.